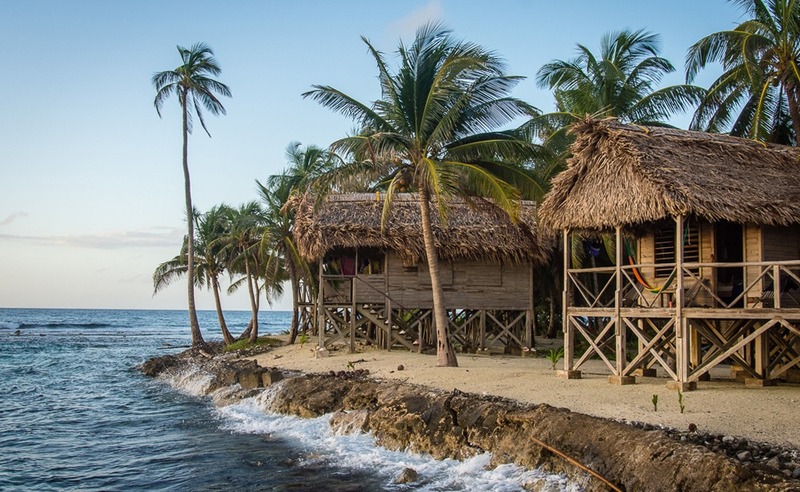 If you are planning to visit Belize, likely you have around 8 or 9 days to spend on your vacation. Most people like to do a combination of island and inland. Then they get the best of both: incredible Caribbean island with white coral sand and tall, shady palm trees coupled with deep jungle full of tropical birds, exotic flowering plants, and Mayan ruins. Our island packages to Long Caye are some of the best no-hassle all-inclusive adventures you can find. I find that people often like a combination of a set package with some Belize- on-your-own so that they can spend part of their week just winging it, and part of the week on our island on a no-brainer tour where everything is within paddling or swimming distance of our shore. No packing and unpacking, no figuring out where to eat or where to stay, and since it’s all inclusive, no surprises on the final bill. Our Adventure Island at Glover’s Reef First Half package is a 6 night package, 4 on the island, and the first and last in Belize City. This will dovetail perfectly with a trip to the Community Baboon Sanctuary (Howler Monkey preserve) for 2 nights. This 8 night itinerary is mid-week to mid-week, designed especially that way so that you get the best rates on air tickets. Everyone wants weekend to weekend, so if you can do the opposite, you might save as much as $1-200! The inland part of the itinerary takes in a wildlife preserve, a birding preserve, a Mayan ruin, the Belize Zoo, and our favorite restaurant! 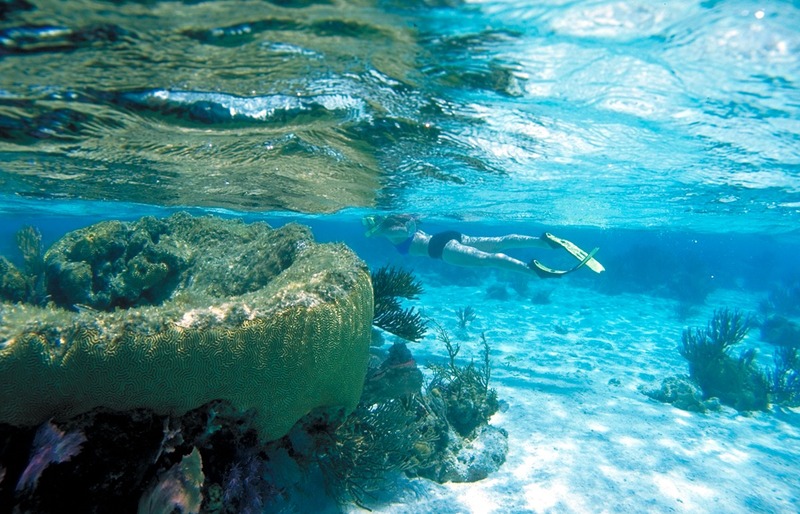 With this short trip itinerary, you will get to see a huge selection of the best of Belize. Here’s the itinerary with links and pricing (all rates in US$). We start out the trip by renting a car and transferring to the Howler Monkey Resort. Although simple, it’s budget friendly and in a fabulous location. Wednesday – fly to BZE. You will probably land sometime in the early afternoon. Go through customs and immigration and meet your rental car pickup from CarOne Rental Belize. They will drive you 15 minutes to their office which is almost directly across the highway from the Biltmore where you will be meeting us on Friday, so it will be a cinch to return the car at the end of the trip (and their airport pick-up will save you $30 on the cab ride into town). The cost for a Dodge Avenger is $60/day, and you will need it for 2 days. 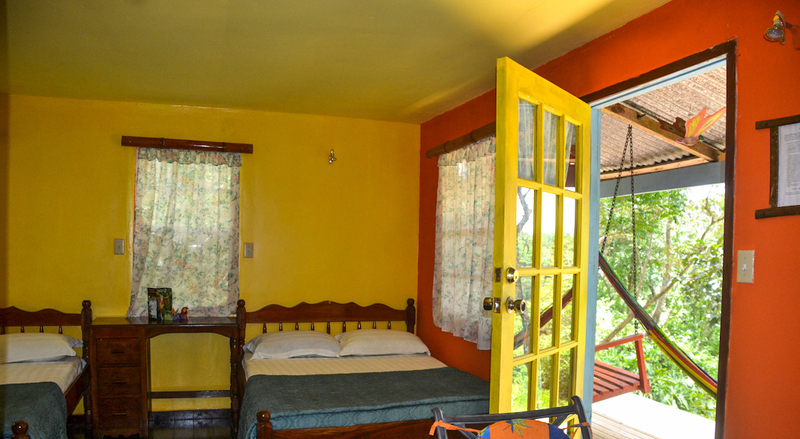 Once you have your car, drive back toward the airport and beyond to Howler Monkey Resort. Located in the heart of the Community Baboon Sanctuary at the village of Bermudian Landing, you are guaranteed to see more Howlers than you have ever seen in your life! This simple jungle lodge is the perfect place to spend the next 2 nights, and it’s a great deal at $100 – $140/night, depending on room chosen, and this price includes breakfast and dinner! Thursday – Before your trip, make a reservation for an early morning birding tour with the Birds Eye View Lodge at Crooked Tree. This inland lagoon is located about 45 minutes from your lodge. Drive out past the Community Baboon Sanctuary and back to the Northern Highway and turn left (north). At the village of Sand Hill, continue on the Northern Highway (left fork). Drive another 10 miles to the turnoff to Crooked Tree Wildlife Sanctuary and follow the signs to Bird’s Eye View Lodge. You’ll have to get there early, tours start at 6 or 7 am. They take you on a boat into the secret, marshy parts of the lagoon. During this 3 hour tour you will likely see 30 different exotic bird species or more. 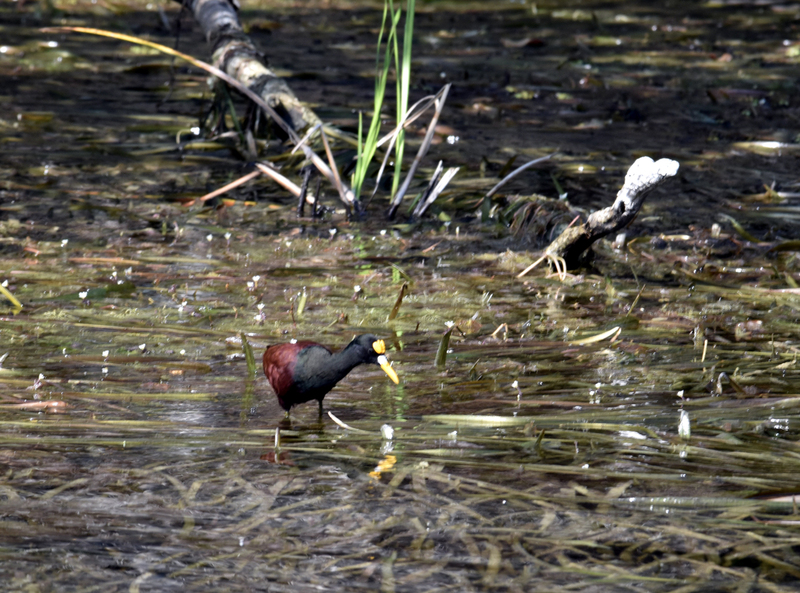 The birding tour for 1-3 persons is $125, each additional person is $35. After the tour, return to the lodge for lunch, which is $15 per person. Their food is delicious! Make sure they know that you plan to have lunch there after the tour. Visit this blog post to learn more about the best birding tour in Belize! After lunch, drive to Altun Ha Mayan ruin. Retrace your route back to Sand Hill, then take the other fork, which when coming from Crooked Tree will be a left. Go about another 10 miles to the turnoff for Altun Ha. The entrance fee is $5 US per person. It’s possible to tour the ruins without a guide, but we do recommend you hire one right there at the gate. We don’t know the exact rate, but it will be very affordable and will increase your enjoyment of the ruins. Return to Howler Monkey Resort after the ruins. Day 3 – Driving tour on your own, Community Baboon Sanctuary, Belize Zoo, and Cheers for lunch! 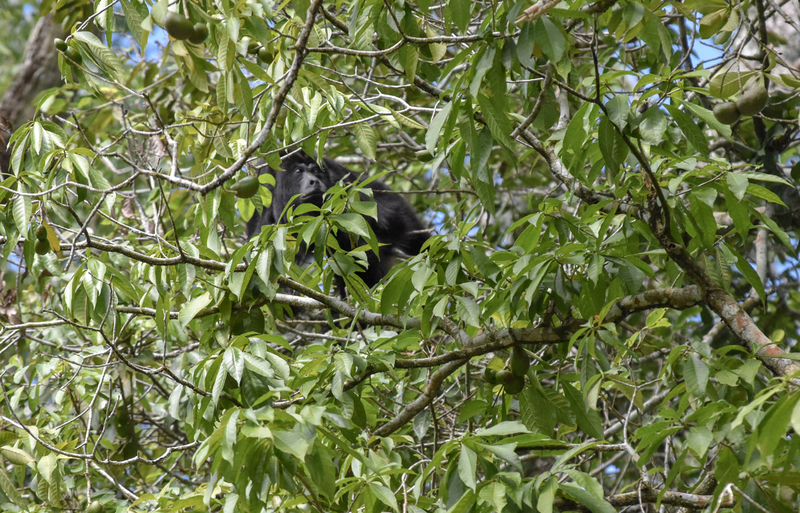 Friday – This morning you will first move out of your rooms because you won’t be returning to the Howler Monkey Lodge. After breakfast drive just a mile or less to the museum of the Community Baboon Sanctuary. This cute little homegrown museum has a lot of great info, and it costs just $3/person to get in. Be sure to hire a local guide who is probably hanging out right there to take you to see the monkeys. They will walk you the equivalent of half a block to where the monkeys are right by the path. They are always knowledgeable about the monkeys, having grown up there with them nearby all their lives. When you are done at the museum, drive back towards the highway, but take a right turn toward Hattieville at the village of Burrell Boom. This will take you through a part of Belize you have not seen before. You’ll pass the prison. Don’t stop there! At Hattieville you will hit the Western Highway, turn right toward the Belize Zoo, which is about 15 miles from this turn off. The Belize Zoo is internationally famous. All animals are rescues and all are native to Belize. It’s a fantastic zoo and you’ll get to see jaguar, jaguarundi, tapir, and other animals you may never have even heard of. The entrance fee is $15 per person. Before turning into the zoo, decide if you want to have lunch now, or several hours later. Cheers is our favorite restaurant in the whole country, and it’s just a few miles more on the left (the zoo is on the right). Drive past the turnoff to Dangriga (the Coastal Road) and look for Cheers, you can’t miss it. Lunch will cost you about $10-12 per person. Spend several hours at the zoo, it’s incredible. Just make sure you have enough time (to be safe, leave by 3:30 pm) to drive back to Belize City, drop everyone and luggage at the Biltmore, while the driver turns in the vehicle at CarOne Rental just a few blocks away, walking back to the Biltmore. Check in and be ready to meet your Slickrock guide at 5:30 pm for your trip meeting, shopping trip to nearby Brodies for last minute items, and dinner at the hotel. We go to bed early because we are getting up early to catch the boat to the island! Once you meet us, everything but your bar bill is covered: lodging, dinner and breakfast the next morning at the hotel. The cost for the Adventure Island at Glover’s Reef 6 night package is $1675 per person although if you have a group of 4 or more, you will get 10% off for each person! Day 4 – Transport to the island, move into cabanas, go snorkeling! Saturday – After group breakfast walk to our private dock two blocks away. Your luggage is driven. From here we travel three hours by boat to Long Caye (65 miles). After lunch, move into your cabana, explore the island, and snorkel right off our shore after the snorkel orientation. Every night we have happy hour, appetizers, and volleyball before dinner and socializing after. Sunday – Our sea kayak orientation is this morning: we cover paddle strokes, entering and exiting the kayak, and rescue techniques. Both this and the snorkel orientation the afternoon before are required, as we don’t offer these again. Starting in the afternoon, the itinerary is open. Several things are offered at once and you can choose what you wish to do. After lunch one guide takes a group paddling to a nearby patch reef to snorkel from the kayaks, while another guide offers windsurfing instruction. Certified divers may also begin diving. Monday – The first Discover Scuba/Resort course is often offered this morning for beginning divers. Others enjoy a morning paddle around the island or go diving. 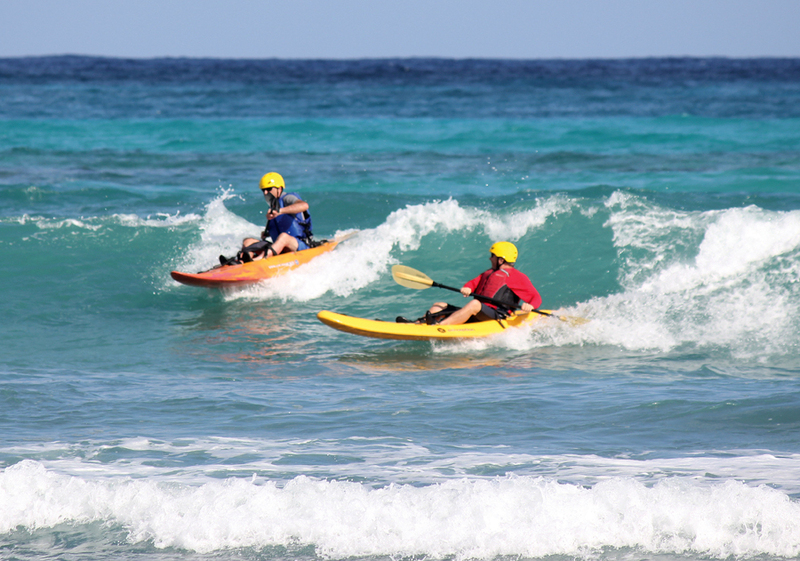 Both windsurfing and kayak surfing orientations are offered in the afternoon. You may join one or both, then continue to practice these sports with or without a guide for the rest of the week. 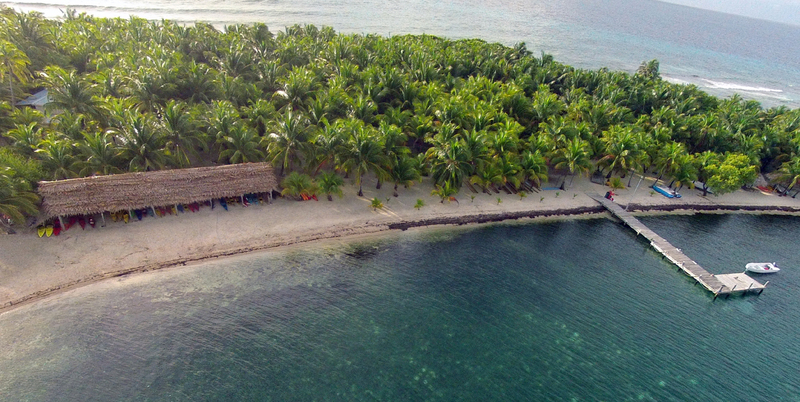 Tuesday – Paddle your kayak or your paddleboard five miles round-trip to Middle Caye to tour the Marine Research Center, home base for marine biologists. We go for a fabulous snorkel while we are there. You may also choose “island time” and stay on the island. 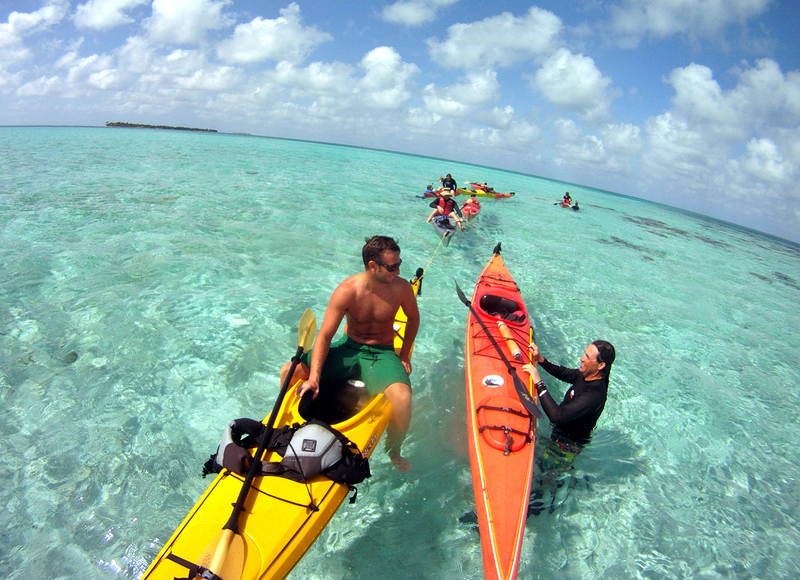 You can sea kayak, snorkel, dive, surf kayak, windsurf, or just relax. Wednesday – One final dive or snorkel to “The Wall”, where the ocean floor drops from 40 to 2,600 feet in under a mile. After lunch we return to Belize City. Our arrival time cannot be predicted since it depends on factors we cannot control. Therefore, guests should not make other plans for Saturday night. After checking into the Biltmore, guests are on their own for dinner. 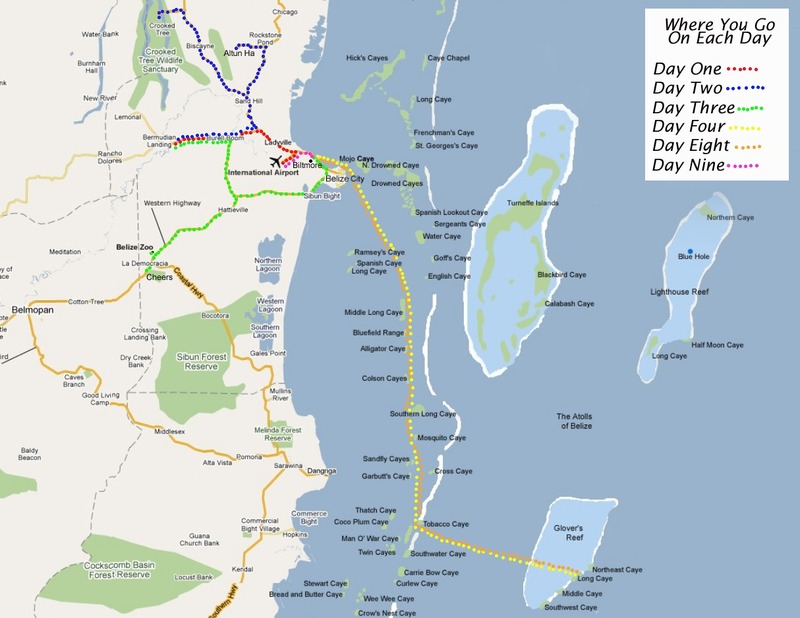 Thursday – Earliest day to fly home, or continue to other spots in Belize for the rest of your trip. Total 8 nights, for 2 persons Approximately $2250 per person or about $285 per day all inclusive, including air.